With one foot in the library and the other on the dancefloor, Voxtrot combine classic 60’s pop with the heady, subversive sounds of 80’s Britain and still come out ahead of their time. Originally conceived as an outlet for vocalist Ramesh Srivastava to record a handful of songs he had written, it soon became apparent that Voxtrot was meant to be more than a home recording project. So, when Srivastava took a break from his English Lit studies in Scotland, he recruited Jared Van Fleet (guitar/keyboard), Matt Simon (drums), Mitch Calvert (guitar), and Jason Chronis (bass) to join his project. Born of animated indie pop that easily receives comparisons to Belle and Sebastian and similar European groups, Voxtrot came to be stateside, in Austin Texas. Garnering considerable buzz from bloggers as well as high-profile magazines before even releasing a full-length, Voxtrot signed with Playlouder, an imprint of The Beggars Group. In addition to their self-titled LP that was released this past May, the band has released a series of EPs - Raised by Wolves and Mothers, Sisters, Daughters & Wives - on their own label, Cult Hero. Au Revoir Simone started life in the Fall of 2003 when Erika (Forster, keyboards & vocals) and Annie (Hart, keyboards & vocals) first became acquainted on a long train ride home to NYC from a weekend getaway with friends. Along the way they exchanged stories and ambitions, and discovered that they shared a common desire to form an all-keyboard band. When they returned to NY, they started meeting regularly to play music. After a time their friend Heather (D'Angelo, drum machines, keyboard & vocals) started joining in at these informal bedroom band practices, which also included former member Sung Bin Park (keyboard & vocals). Before too long, they started playing shows around NYC and Brooklyn. In January of 2005, Sun Bin left the band and the girls started anew as a trio. Keyboards found their natural home in the hands of Au Revoir Simone (or perhaps it was the other way round). A romantic notion it may be, but fate you might say had had a hand in their meeting – born out of a common love of synths then, Au Revoir Simone came to be. The trio produced their debut with the release of mini album, Verses of Comfort Assurance and Salvation, on Moshi Moshi Records in 2006. Offering up a generous helping of charm and intelligence, 'Verses...' is a lesson for us all in what expertly layered synths, ethereal, heart felt and heart-rendering vocals, dreamy melodies, and palpitating drum machine-induced disco beats should sound like when properly woven together. 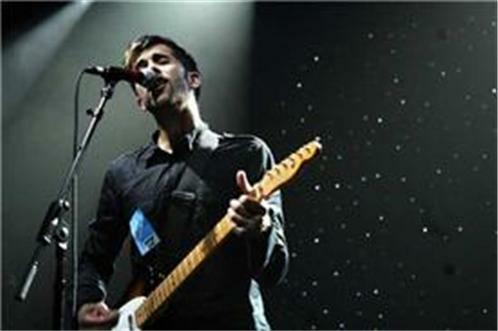 In 2006 Au Revoir Simone toured the US, Canada and Europe with We Are Scientists. They have recently completed a US tour with Peter, Bjorn and John. Their first full length album, The Bird of Music was released on the 5th March of 2007.